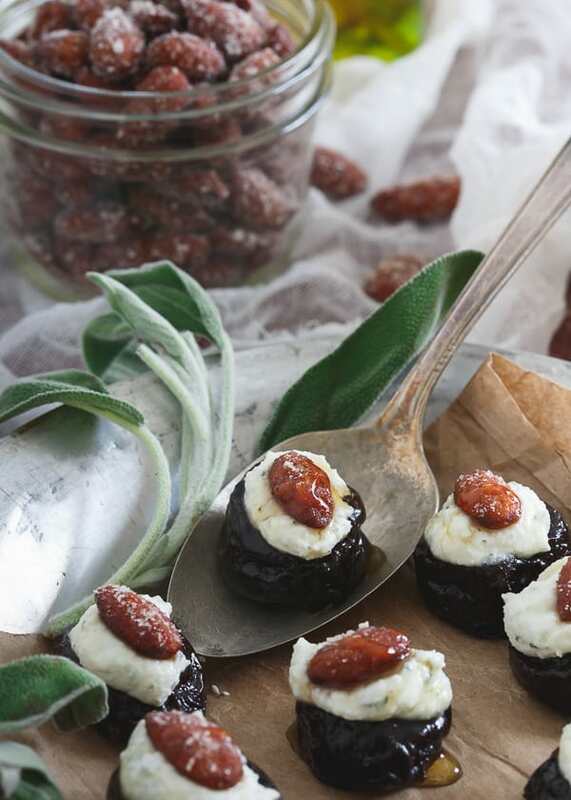 Stuffed with a whipped ricotta sage mixture, topped with a honey roasted almond and drizzled in more honey, these savory sweet bites are one quick and delicious appetizer. Omg, she said prunes. Get over it. We’re all adults, let’s just go with the fact that prunes are delicious and ignore the obvious. Although, I was totally that kid who complained/whined/threw tantrums when my mom tried to force feed my constipated 6 year old self those every night. The Metamucil alternative was even worse though, so I ate the damn prunes. We all like plums, right? I don’t even get why once they dry out and we change their name people are all like “omg, ew!”. And while we’re on it, how come raisins don’t get the same negative fate? These are the big time life questions I have. ps- this spinach prune smoothie uses them and it’s DELICIOUS – don’t let the color fool you! Thankfully, I’ve grown up and now willingly buy containers of these little bathroom miracle workers not for function but for taste. With a container of about 700 of them (ok not really but there are a TON in there), I got thinking they’d make for a crazy great sweet and savory appetizer perfect for that little thing called New Year’s Eve TOMORROW! (omg, it’s almost 2016). 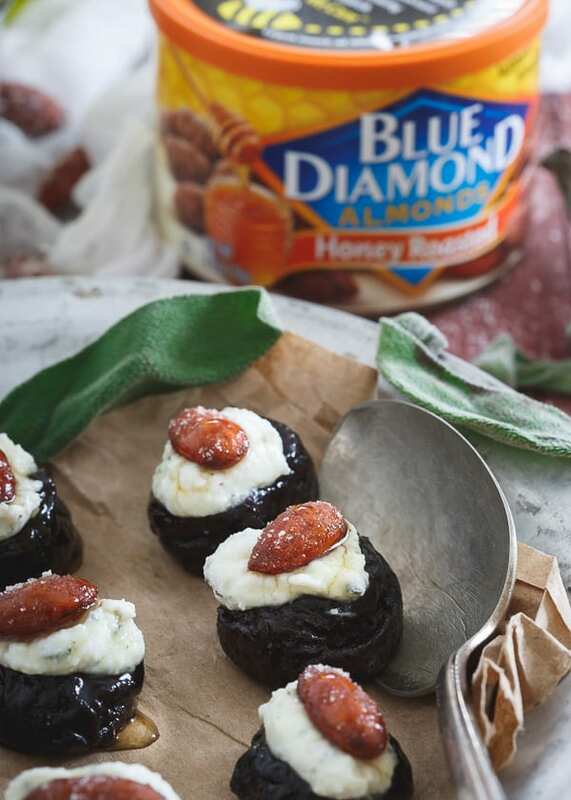 In 10 minutes savory whipped sage infused ricotta stuffed inside prunes, topped with a perfectly honey roasted Blue Diamond almond and drizzled in honey can be ready for whatever party you’re hosting or going to in celebration. Combine ricotta, sage, salt and pepper in a food processor. Process for 20 seconds until fluffy. With the processor running, slowly pour in the olive oil and continue processing until incorporated. Spoon the ricotta mixture into the prunes. Drizzle the stuffed prunes with honey. *This post is sponsored by Blue Diamond Almonds. Ha! I use to get EXCITED when I was served prune juice or prunes–I have always loved their flavor so this is perfect for me! Bahaha I can totally see you tantrumming ;) These look phenom and I love them paired with my favorite honey roasted almonds! This combination looks so great – and simple to make! These are gorgeous! 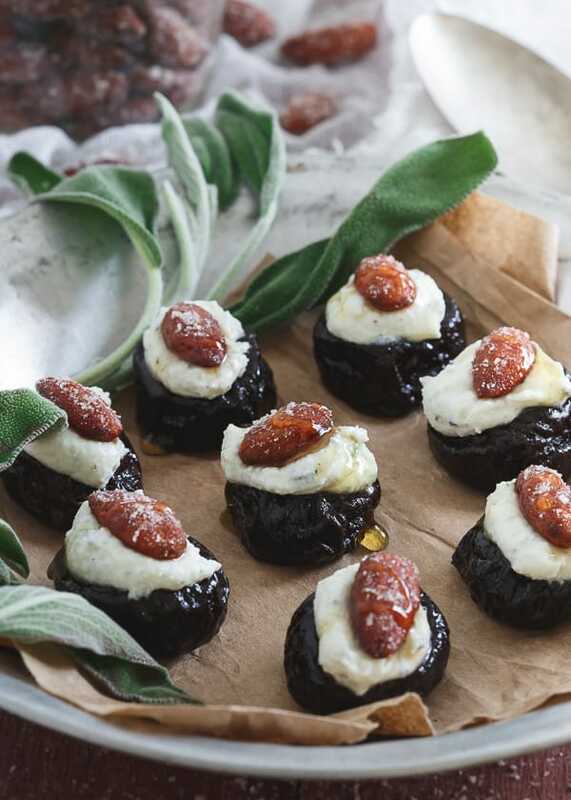 Prunes are making a comeback…they were all the rage in the 60s and 70s! I have no idea why people are weird about prunes! I LOVE them! Prune cake, oh my goshhh! Oh my, these look so good. Someday I will have to make these. These sound fantastic! 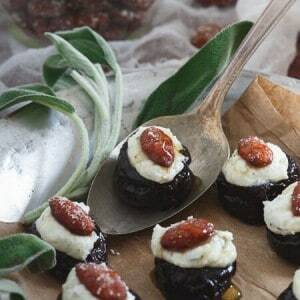 !…….and BYW, I but prunes to snack on ;) add the almonds and ricotta and I’m in heaven! !